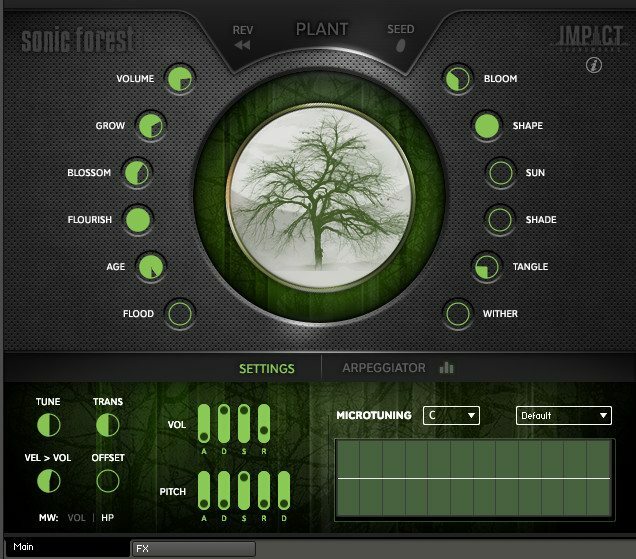 Sonic Forest is a new experimental Kontakt instrument released by Impact Soundworks, featuring a rare sample set and custom granular synthesis engine. With beautiful forest­ themed controls and imagery, everyone from novice producers to professional composers can create endlessly evolving granular textures, ambient atmospheres, and dark soundscapes (yes, the concept reminds me of our beloved Synplant, which is a good thing!). S​onic Forest​is available for the list price of $​20, with 25% of all sales to be donated to charity. The sample library includes recordings of a unique handmade instrument of the same name, which produces a unique range of both harmonic and dissonant tones when struck or bowed. In total, there are hundreds of strikes, taps, and bowed techniques with different pitches, dynamics, and variations which can all be played as a traditional chromatic instrument. The true depth of the S​onic Forest​is revealed when one of its sounds is ‘p​lanted’​into the granular forest engine, turning a single mallet strike, tap, or bow into a continuous evolving texture of sonic growth. Then, using a variety of evocatively­named knobs like Flourish, Bloom, Blossom, Sun, and Flood, both the sound and the serene visuals of the instrument can be morphed in an infinite variety of possible combinations. Buying Sonic Forest you’ll also support a great cause. Flora & Fauna International is the oldest conservation charity in the world, with over 100 years of dedication to protecting our planet’s forests and other habitats. Sonic Forest i​s available now as a digital download for $20. Audio and video demos, specifications, and more product information is available at the Impact Soundworks website.